fanplot(historical,forecast) generates a fan chart. In time series analysis, a fan chart is a chart that joins a simple line chart for observed past data with ranges for possible values of future data. The historical data and possible future data are joined with a line showing a central estimate or most likely value for the future outcomes. 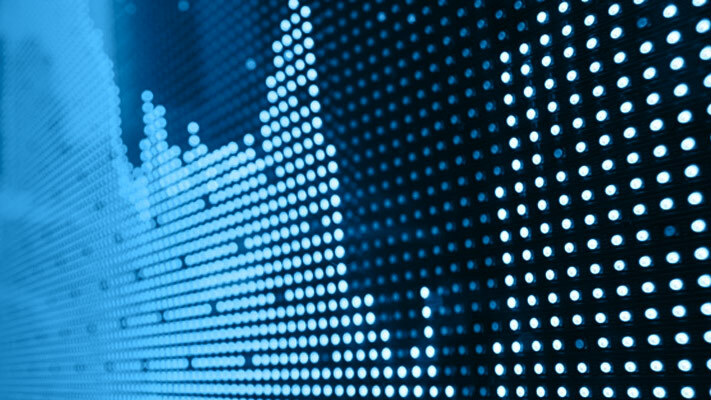 Matching — This scenario occurs when the time period perfectly matches for historical and forecast data. 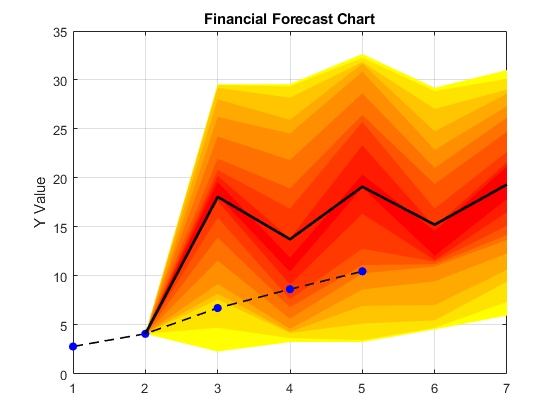 Backtest — This scenario occurs when there are overlaps between historical and forecast data. Gap — This scenario occurs when there are NaN values in the historical or forecast data. fanplot(___,Name,Value) generates a fan chart using optional name-value pair arguments. h = fanplot(historical,forecast) generates a fan chart and returns the figure handle h. In time series analysis, a fan chart is a chart that joins a simple line chart for observed past data with ranges for possible values of future data. The historical data and possible future data are joined with a line showing a central estimate or most likely value for the future outcomes. h = fanplot(___,Name,Value) generates a fan chart and returns the figure handle h using optional name-value pair arguments. Define the data inputs for historical as a 5-by-2 cell array and forecast as a 5-by-21 cell array with 20 observations. The dotted points are the historical lines and the filled lines indicate the mean for the forecasts. This fanplot represents a matching scenario where the time period perfectly matches for the historical and forecast data. Define the data inputs for historical as a 5-by-2 matrix and forecast as a 5-by-21 matrix with 20 observations. Generate the fan plot and return the figure handle. The dotted points are the historical lines and the filled lines indicate the mean for the forecasts. 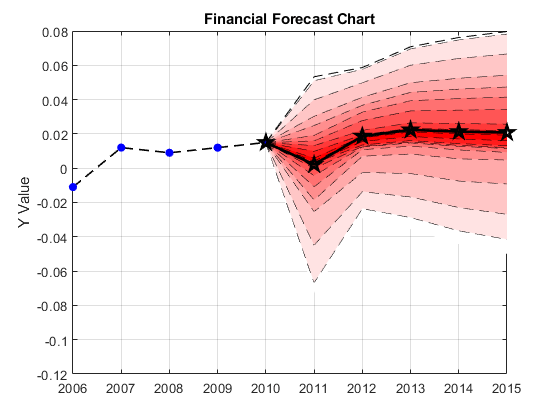 This fanplot represents a backtest scenario where there is an overlap between the historical and forecast data. Generate the fan plot using name-value pair arguments to customize the presentation. Create table of historical dates and data. Create table of forecast dates and data. Plot the data using fanplot. Number of quantiles to display in fan chart, specified as a positive integer. Style of the lines separating fans, specified as a character vector. For more information on supported character vectors for line styles, see Line Properties. Color of lines separating fans, specified as a character vector for color or an RGB triplet. For more information on supported color character vectors, see Line Properties. When N = NumQuantiles, the color of each fan is specified by the corresponding row in the matrix. When N = ceil(NumQuantiles/2), the specified colors represent the bottom half of the fans. The colors of the top half are determined by reversing the order of these colors. For more information, see ceil. When N = 2, the colors in the bottom half of the fan are a linear interpolation between the two specified colors. The pattern is reversed for the top half. Marker symbol of historical line, specified as a character vector. For more information on supported character vectors for markers, see Line Properties. Marker size of historical line, specified as a positive value in point units. Marker fill color of historical line, specified as a character vector with a value of 'none', 'auto', a character vector for color, or an RGB triplet. For more information on supported character vectors for color, see Line Properties. Marker outline color of historical line, specified as a character vector with a value of 'none', 'auto', a character vector for color, or an RGB triplet. For more information on supported character vectors for color, see Line Properties. Color of historical line, specified as a character vector with a value of 'none', a character vector for color, or an RGB triplet. For more information on supported character vectors for color, see Line Properties. Style of historical line, specified as a character vector. For more information on supported character vectors for line styles, see Line Properties. Width of historical line, specified as a positive value in point units. Marker symbol of forecast line, specified as a character vector. For more information on supported character vectors for marker symbols, see Line Properties. Marker size of forecast line, specified as a positive value in point units. Marker fill color of forecast line, specified as a character vector with a value of 'none', 'auto', a character vector for color, or an RGB triplet. For more information on supported character vectors for color, see Line Properties. Marker outline color of forecast line, specified as a character vector with a value of 'none', 'auto', character vector for color, or an RGB triplet. For more information on supported character vectors for color, see Line Properties. Color of forecast line, specified as a character vector with a value of 'none', a character vector for color, or an RGB triplet. For more information on supported character vectors for color, see Line Properties. Style of forecast line, specified as a character vector. For more information on supported character vectors for line styles, see Line Properties. Width of forecast line, specified as a positive value in point units. Figure handle for the fanplot, returned as handle object.